Two years ago, Ellen Martinsen, was collecting mosquitoes at the Smithsonian's National Zoo, looking for malaria that might infect birds—when she discovered something strange: a DNA profile, from parasites in the mosquitoes, that she couldn't identify. By chance, she had discovered a malaria parasite, Plasmodium odocoilei—that infects white-tailed deer. It's the first-ever malaria parasite known to live in a deer species and the only native malaria parasite found in any mammal in North or South America. Though white-tailed deer diseases have been heavily studied—scientist hadn't noticed that many have malaria parasites. Martinsen and her colleagues estimate that the parasite infects up to twenty-five percent of white-tailed deer along the East Coast of the United States. Their results were published February 5 in Science Advances. "You never know what you're going to find when you're out in nature—and you look," says Martinsen, a research associate at the Smithsonian's Conservation Biology Institute and adjunct faculty in the University of Vermont's biology department. "It's a parasite that has been hidden in the most iconic game animal in the United States. I just stumbled across it." Though Martinsen and Schall are quick to note that they anticipate little danger to people from this newly discovered deer malaria, it does underline the fact that many human health concerns are connected to wider ecological systems—and that understanding the biology of other species is a foundation to both conservation and public health management. Zika virus is recently making worrisome headlines and "there's a sudden surge in interest in mosquito biology across the United States," says Schall. "This is a reminder of the importance of parasite surveys and basic natural history." In 1967, a renowned malaria researcher reported he'd discovered malaria in a single deer in Texas. But the received understanding was that "malaria wasn't supposed to be in mammals in the New World," says Schall, who has studied malaria for decades. "It was like the guy was reporting he saw Big Foot," and no other discoveries were made after that. 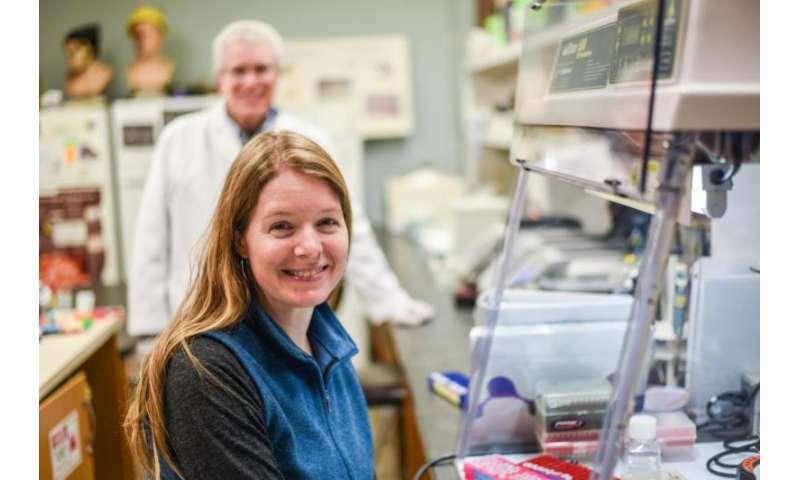 But now Martinsen and her colleagues have discovered that the deer malaria is widespread—though it's "cryptic" she says, because the parasites occur in very low levels in many of the infected deer. "Ellen spent days and days looking through a microscope at slides that were mostly empty," Schall says, but eventually found the parasites. Combined with sensitive molecular PCR techniques to understand the genetics, the team confirmed a high prevalence of the disease—between eighteen and twenty-five percent—in sites ranging from New York to West Virginia to Louisiana. The new discovery fundamentally changes our understanding of the distribution and evolutionary history of malaria parasites in mammals, Martinsen says. Some scientists wondered if the deer malaria could have jumped from people or zoo animals in the recent past. But the new study suggests otherwise. The team's data shows that the deer actually carry two genetic lineages of the malaria parasites—"probably different species," she says—and that the two lineages are substantially different from each other. This divergence between the two forms of malaria was used by the scientists as a kind of molecular clock. "We can date the evolutionary split between those two lineages," Martinsen says—to 2.3 to 6 million years ago. Which probably means that when the ancient evolutionary ancestors to white-tailed deer traveled from Eurasia across the Bering Land Bridge to North America in the Miocene, some 4.2 to 5.7 million years ago—malaria came along for the ride. "We think malaria is native to the Americas," Martinsen says, "that it's been here for millions of years." Malaria is a major problem for people in many parts of the world—and for many species of wildlife too. It has been devastating bird species in Hawaii and Bermuda, among many epidemics. 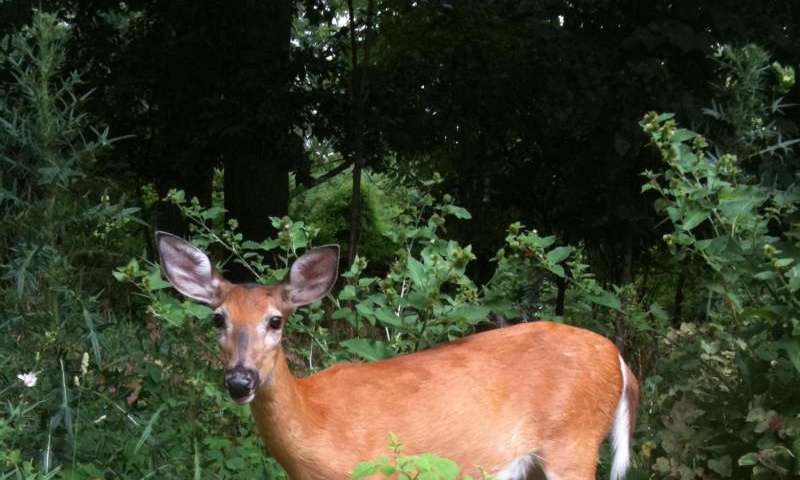 Whether it is hurting white-tailed deer in America is an open question. Martinsen suspects not, because she'd expect to see more obviously sick animals. But Schall wonders if, like some human malaria infections, the disease causes a low-level burden that hurts deer populations. They both agree that it is an area that calls for more research—and that the new study raises many other questions, including whether the parasite might infect dairy cows or other hoofed species. Ellen Martinsen completed her undergraduate and doctoral training at UVM in Joe Schall's lab and went on to do her postdoctoral research at the Smithonian Conservation Biology Institute's Center for Conservation Genetics. The new discovery drew on a team of scientists and veterinarians at the Smithsonian and other institutions, who studied samples from both live and necropsied deer as well as mosquitoes. Additionally, Martinsen returned to Schall's lab for some of the new research. "Malaria is a top parasitic disease in humans and wildlife," Ellen Martinsen says. "It's important that we gain a better understanding of its diversity and distribution not just across humans but across other species too." Ever since the envirokooks banned DDT (and killed 45 million Africans and Asians in the process) insect-borne diseases have flourished. Now deer have malaria and the Zika virus threatens thousands. Thanks envirokooks, we OWE you. Yeah, we invented malaria, . . . ridiculous. But it is spreading, . . why? AGW. What are YOU doing about AGW? Rrander, the Internet is full of ramblings that originate in the diseased minds of delusional psychotics. Pretty stiff competition.....but you just won the award for the most delusional psychotic posting I've read today. Congratulations. Another subject - brain death is surmised by medical professionals to be a painless process. You likely did not feel a thing when you suffered yours. From Scientific American (2009): "In 2007, at least 3,950 tons of DDT were sprayed for mosquito control in Africa and Asia, according to a report by the United Nations Environment Programme."